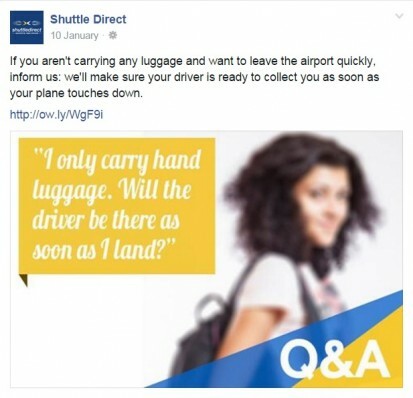 How we used our unique "Thematic" approach to help boost sales by augmenting Shuttle Direct's existing Social Media programme with additional content to communicate the main benefits and USPs of their transport services. 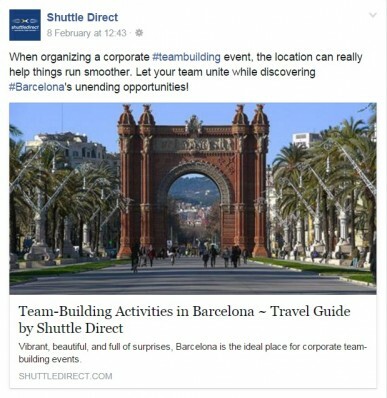 Shuttle Direct, creator of the most widely used ground transport booking engine in the world, is a major international shuttle brand offering transport and transfer services from hundreds of airports and train stations across Western & Eastern Europe and North Africa. With a massive multilingual client base, the Client approached LeadGeneratorsDigital to help them with the important task of developing a coherent Content Marketing concept for their social media programme, which would not only help them communicate effectively with their global customer base and engage their readership, but also improve the salesmanship of their social media programme and the ROI of the allocated budget. At LeadGeneratorsDigital we believe that, while social media content can and should be more relaxed and “social” in nature, we must not forget that, ultimately, it has a far more demanding business purpose in life: to promote the brand and to increase sales. 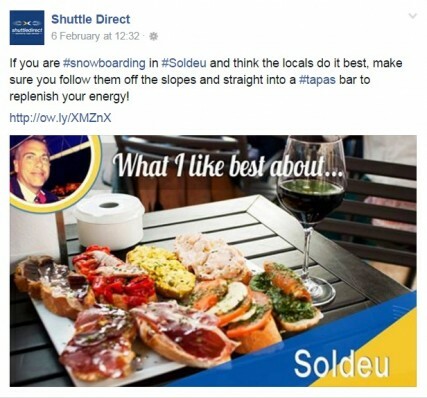 To help Shuttle Direct achieve this business goal with its social media programme, we began by working with them to create a set of Content Themes – each of which would communicate an important USP, customer benefit, sales message, etc. Once agreed, we created a strong graphic concept for each of the themes so that each would communicate the message very clearly and become instantly recognisable. The purpose of this content theme was to communicate the wide range of destinations on offer by the Client, and to communicate the very low prices for its transfer services. Each message spotlighted a different route and highlighted its amazing price. 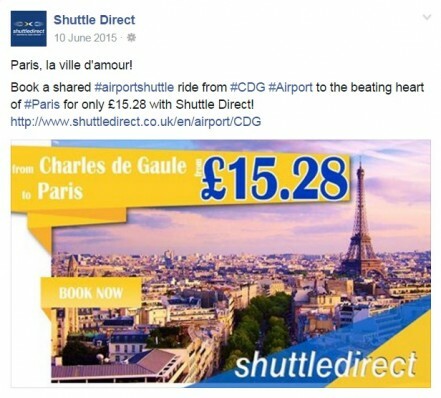 Route Promotion post for Shuttle Direct. Our client prides itself on its superb service. The purpose of this theme was to communicate a friendly and helpful customer service team. Each message answered a different customer question. The Question & Answer theme answered customers’ most frequently asked questions. We all know that reviews, references and endorsements are a vital part of encouraging and promoting sales. Here, we felt that we needed to create a content theme that showcased happy customers with positive reviews. For this reason, each message showed a different, real customer review. A testimonials post, using real customer reviews that are verified by Feefo. This was a very interesting theme based on the success of one part of our blog content programme. We discovered that our “Travel Guide” blog posts (which not only provided unique and interesting content for readers but also useful information about where to stay and how to get there) were particularly popular with readers and generated sales for the company. For this reason, we decided to create a content theme for each Destination Highlight that would send traffic from social media to the website. Each of the Travel Guides posts highlighted one of Shuttle’s priority destinations from an interesting and useful angle. 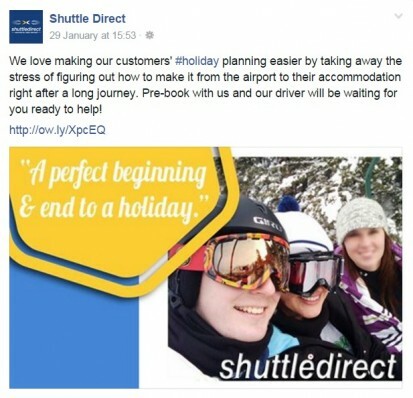 As Shuttle Direct’s founder and General Manager, we put Bruno Calzaverini forward as the face of Shuttle Direct. In each post belonging to the “Favourite Destinations” theme, Bruno would talk about one of the destinations his company serves and highlight some of the best things he discovered there. An example of a post belonging to the “Favourite Destinations” theme. By creating and publishing a different Content Theme every day and peppering it amongst the more “social” content that was already being created and published by the Client, we were able to augment the scope, the reach and the salesmanship of their social media presence to help focus the mind of the reader on the great transfer services that Shuttle Direct has to offer its customers across the world.